Run for someone else's life in this addictive 3D action game. 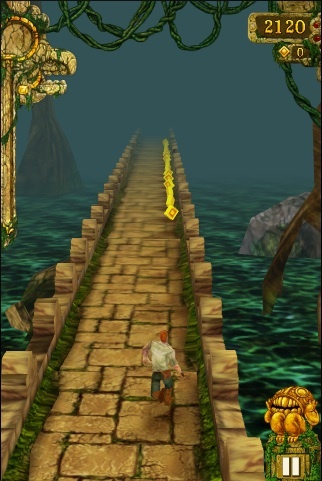 First reaction to Imangi Studios' latest title, Temple Run: oh no, not another running game. For the past couple of months, we thought developers had finally stopped making these video games. You know, the ones where players take limited control over a character that can't stop moving, where it's their job to keep the hero in motion by avoiding obstacles. So yes, Temple Run plays similar to Canabalt, I Must Run and a host of clones, but you know what? It's quite entertaining. The game takes place in a treacherous jungle, where an explorer has just made off with a cursed idol with demons giving chase. With his life on the line, you make split second decisions to prevent this poor guy from falling victim to the bloodthirsty monsters. Viewed from behind the character (the first time we've seen that in a running game), you tilt the iPhone left and right to direct him down a path, swipe left/right to move in those directions, swipe down to slide underneath things and swipe up to jump. Simple. Easy to grasp. The controls just work. Of course, the longer you play, the higher the score. Then you can post it to an online leaderboard, which helps give Temple Run that "just one more time" level of addictiveness. We're also fans of the power-ups scattered throughout the environment, especially the one that creates semi-transparent bridges between gaps, and another that acts as a magnet, pulling in gold coins. Ah yes, the coins. You'll want to collect as many as possible to unlock and level up additional items that give the Indiana Jones wannabe an edge. Conversely, you can buy more using real world currency; 2,500 for $0.99, 25,000 for $4.99 and 75,000 for $9.99. Unfortunately, the scenery doesn't change. It's still the same drab looking jungle. That said, Temple Run is iPhone only. The game works on the iPad, but you have to magnify it 2X to use the controls effectively, and believe us when we say the graphics take quite a hit; thankfully, iPhone 4 users benefit from Retina Display support. On that note, it remains to be seen whether Temple Run is the greatest running game on the App Store, but it's without question one of the best. For a buck, it's definitely worth a look. What's Hot: Cool Indiana Jones vibe, excellent controls, Game Center support, Retina Display, addictive. What's Not: No iPad version, constantly repeating scenery, in-app purchases seem unnecessary, unremarkable graphics.